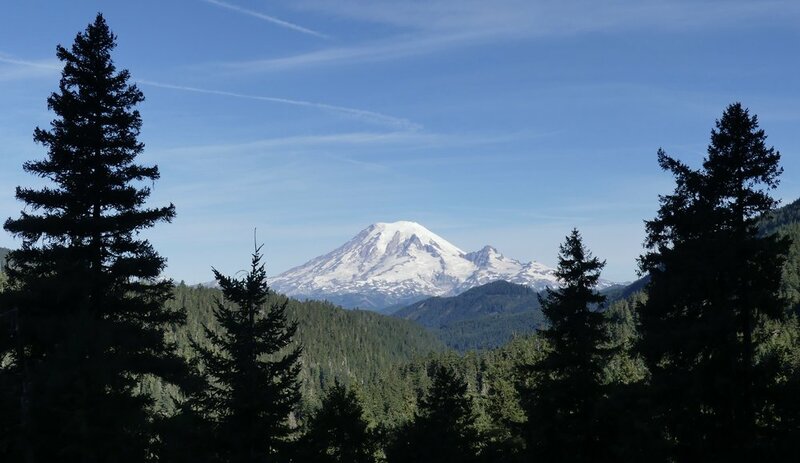 A little before 4 pm on 20 March 1980, a seismograph in the geophysics department of the University of Washington in Seattle detected the re-awakening of one of the Pacific Northwest's volcanic peaks that had been sleeping for 123 years. A study published a couple of years previously had warned that an eruption was likely before the end of the century. Now magma had begun to rise from deep within the earth beneath Mount St Helens. The magma was diverted sideways along a rock fracture (a strike-slip fault), and began pushing the northern flank of the mountain outwards by five feet a day, which was monitored constantly by geologists. There were other signs of change: a crater formed on top; there were earth tremors; and eruptions of steam and ash, from the crater and newly developed side vents. Rumblings and huffings-and-puffings continued for several weeks. By the end of April the bulge extended 300 feet above the original hillside and was still expanding. 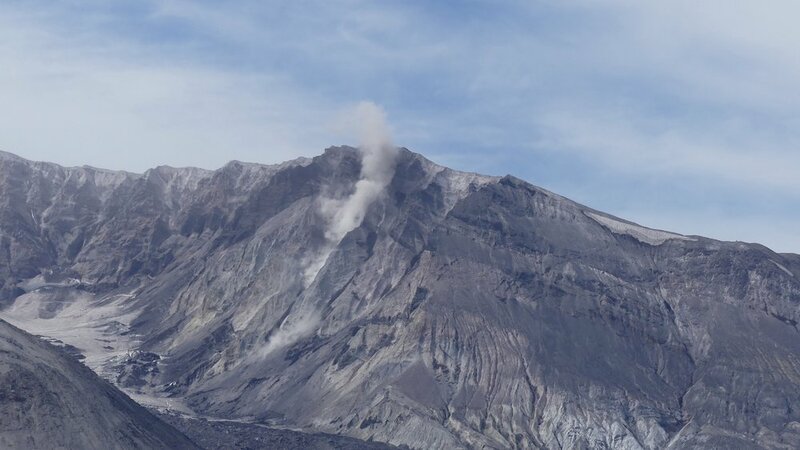 There was much speculation among vulcanologists about when and how Mount St Helens might blow, but one thing was agreed: something had to give. On the morning of 18 May, the north face of the mountain collapsed, triggered by an earthquake and creating a huge and deadly avalanche, stage one of the eruption. Superheated water in the magma flashed into steam and, combined with gases dissolved in the magma, produced a massive lateral 'explosion' of gas, ash and rock that created two strange and angry bulbous clouds, one emanating from the top of the mountain and the other from the landslide: stage two of the eruption. The clouds coalesced and accelerated, overtaking the landslide and obliterating it from view. The blast lasted three minutes and travelled at hundreds of miles an hour towards Spirit Lake and the northern fork of the Toutle River. Trees up to 17 miles away were flattened by it. US Geological Survey vulcanologist David Johnston, who had been observing the volcano's activity from a ridge five miles north of the mountain since sun-up, probably realised the ambition of a lifetime for a few moments before he died. His body, car and trailer were never found. The Ridge and an Observatory opened in 1997 were named in his honour. Johnston was one of 57 people who lost their lives, almost half of whom were never found. An area of the landscape violently transformed by that catastrophic event has forever been preserved in the Mount St Helens National Volcanic Monument, lest we become blasé about the awe-inspiring forces of nature. As long as I have known my friend, it has been his ambition to go to the mountain. A journey from Yakima to Vancouver nearly four decades after the eruption meant not to visit was not an option. We set off early from Yakima, back over the Cascade Range on Washington State Route 12. Again we were thwarted by roadworks – 28 miles of them – with a considerable wait by Rimrock Lake. The frustration was forgotten, however, when we rounded a bend and Mount Rainier appeared before us, more like a Hollywood matte than anything real. Just beyond Randle we turned left to begin our ascent to Windy Ridge Viewpoint. The road numbers are confusing: you take State Route 131 off the 12. The 131 becomes Forest Road 25 for 19 miles, at which point you turn right on to Forest Route 99 for 16 miles to the Viewpoint. 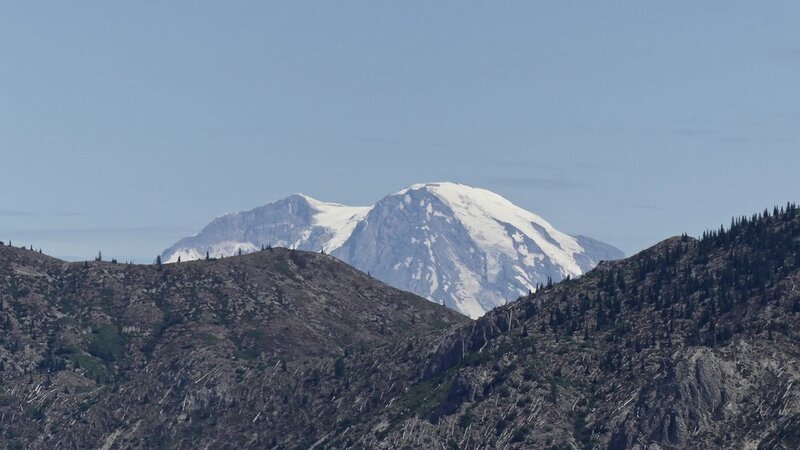 (You can also view Mount St Helens from the west via Route 504.) The road twists and turns, and has steep drop-offs; the surface was awful in places; and there could be wildlife round every corner. So progress was slow. From the first full view, Mount St Helens grabs your attention disarmingly. It's not pretty like its volcano neighbours (see below), its misshapen rocky remnant grey and stark, even hostile. I felt compelled to photograph every detail of the crater, although I needed a zoom that could see round corners. I was awestruck but disturbed. I felt drawn in, but at the same time repulsed. There were occasional puffs of steam from the slopes… I considered fleetingly that the approach road from Randle would have been closed if there were serious signs of activity, right? The landslide of material following the eruption surged through Spirit Lake, creating huge waves that surged up the hillsides, dragging trees, soil, rock and ash back into the water. Thousands of felled trees still litter the lake's surface. 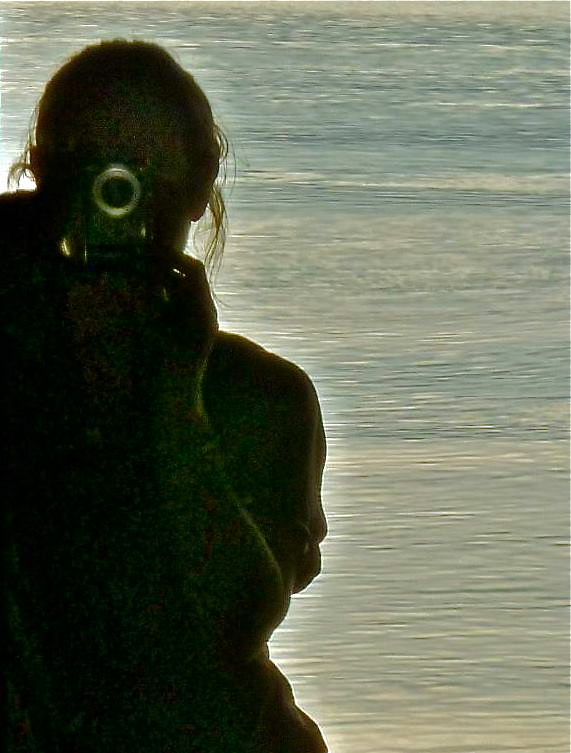 Heat from the eruption and a lack of oxygen saw the end of most of life in the Lake. The waters bubbled as bacteria feasted on debris. Over the next few years rain and snowmelt diluted the toxic waters and weather events introduced more oxygen into the water. Gradually plants and animals returned, but it took a decade for normalcy to be restored. The Lake was larger in area and shallower and boasted more aquatic life than before the eruption. Its ecology was not only restored but acquired greater variety. Slopes closest to the volcano were blasted right down to the bedrock. In the photograph below, the landslide scour line can be seen on the hillside in the centre of the picture. The landslide rushed 1200 feet up the ridge (from the left), gouging the rock before plunging into Spirit Lake. Johnston Ridge is at the extreme left of the picture: the landslide overtopped the Ridge and deposited 40 feet of debris on the other side. The land between the two ridges is the landslide remnant. Vegetation that wasn't swallowed by the landslide was pummelled with hot rocks, ash and other debris. On slopes facing away from the volcano some plants were protected from the blast but were then smothered by ash. The volcano's deadly deeds weren't done. The following day, ice and snow meltwater careened down valleys, carrying away all before it, turning logs, vehicles and debris from destroyed buildings and bridges into lethal projectiles. For more than a day after the eruption began, ash was pumped from the magma chamber inside Mount St Helens up into the atmosphere. It reached 60,000 feet before being carried east across the States by prevailing westerlies. Ash falling across Washington and neighbouring states prevented motorists from seeing where they were going, and many were stranded for days. Inches of the stuff eventually settled over everything. And in two weeks it had travelled around the planet. The surrounds of Mt Saint Helens today are still very much a post-apocalyptic landscape. Dead trees lie flattened in the 'blow-down zone', radiating outwards from the blast site, some smashed to pieces. They lie where they fell, all these years later. Beyond are still standing but dead trees, in the 'scorch zone': new trees have grown in between them. It is an enthralling, unforgettable landscape. The pumice plain to the north of the crater still looks lifeless in places. Several layers of blisteringly hot ash and pumice flowed over this area during the main eruption and subsequent smaller ones. The hummocks to the right of the photograph below are bits of the volcano's top and interior that were carried this far by the landslide. 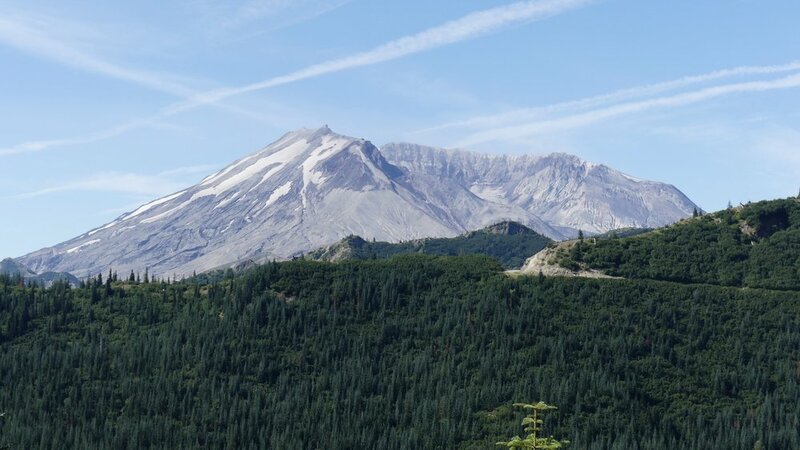 Mount St Helens' nearest neighbours in the Pacific Rim chain are Mount Adams 34 miles to the east, below left, and Mount Hood 62 miles to the southeast. Neither of these two have experienced serious eruptions in a long time, although they do let off steam every now and again. All good dramas must come to an end, and, as in Salem, this visit was no exception. We headed down the mountain and towards the inevitable frustrations of skirting Seattle in rush hour en route to the Canadian border and Vancouver.